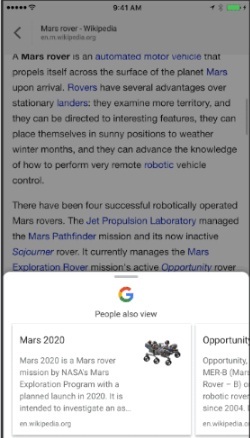 Google Is Going To Update Google’s iOS Search App With “Related Content”, While You’re Reading A Web Page On Google App For iOS, You Will See Articles Suggestion Related To The Content When You Pull Up The Bottom Of The Page. You Don’t Need To Type Anything In Search Box To Learn More About That Content. For Example- You Have Just Finished Reading Article About iPhone X. When You Start Scrolling Up On The Same Web Page, You’ll See Additional Articles That May Interest You, Like Articles About iPhone X Features, iPhone 8. For Example- You Are Reading A Recipe For Roasting Shishito Peppers, You Will Be Able To Jump Straight To Other Ways To Prepare Them. With This Update To Google iOS App, You Will Be Explore More Articles Without Searching. Just Scroll Back Up, You’ll See More Articles. Tap On It To Read. These Updates Is Only For Google iOS App, And Currently Available In U.S., Google Will Expand This Feature Soon To More Languages And Locales. To Use This Feature Update Your Google App And Then Search Away. Google App’s(Android Version) Feed Already Provide Related Articles To Users But Not Like This. Suggested Articles Or Related Only Appears In The Feed. You Need To Go Back To See Other Ones. This Probably The Great Feature For Those Who Loves Reading Latest Articles. Google Recently Updated Its Google Feed to Smart Feed Which Provides Variety Of Content To Users. More You Use Google, The Better Articles You Will Get.